We are winners of Inspiring Innovation! Z-arts won the award for Inspiring Innovation at the Manchester Cultural Awards! Creatives from across Greater Manchester came together last night at the Etihad Stadium to celebrate the brilliance of Manchester culture. 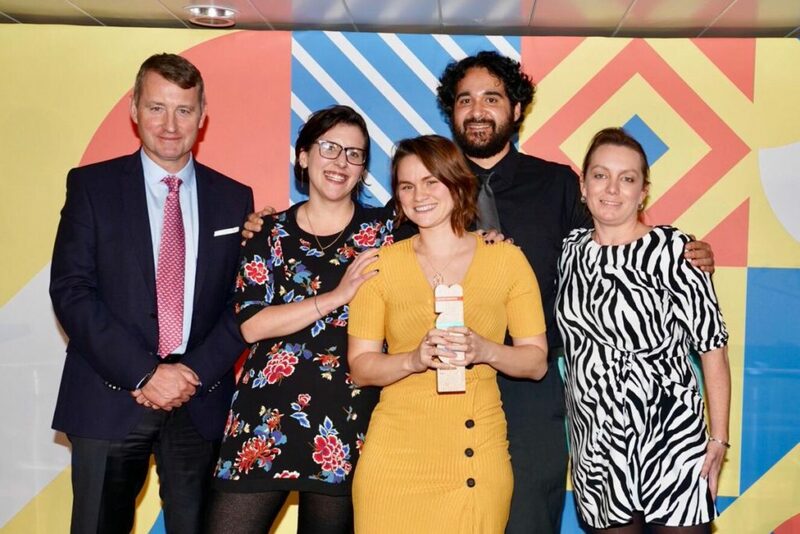 The Manchester Culture Awards celebrate people, groups and organisations who made culture buzz in Manchester during April 2017 to April 2018, and we were over the moon to win the award for Inspiring Innovation. Earlier this year, Z-arts created MY PLANET, a creative arts project aimed at increasing attainment and aspiration for primary aged children in Hulme and Moss Side. Made with support from the Lever Prize 2018 and the North West Business Leadership Team, we worked with Webster Primary School in Hulme to inspire the next generation. The class wrote poetry, created models, went on site visits to STEM industries, wore reflective jackets, built volcanoes, danced, and built a planet entirely of their own design. It was a different way of learning for them and a different way of communicating for the grown-ups involved, using a practical, hands-on approach to engage and inspire the next generation. It was brilliant to see the results of the MY PLANET project, and even more brilliant to get the recognition for the project at the Manchester Cultural Awards. We also received a commendation for Best Performance for The Welcoming Party, which was created by Theatre Rites in collaboration with us and Manchester International Festival, but the award went deservedly to Tony Walsh’s performance of This is the Place at the vigil after the Manchester Attack last summer. Everyone at Z-arts is proud to be part of the cultural world of Manchester. Arts and culture in this city has always had a strong presence – it can transform lives and inspire change, and Z-arts is more than proud to call ourselves part of this fantastic city. Thank you to everyone who supports us, we couldn’t do it without you!